Teacher Pensions: Should I Stay or Should I Go? 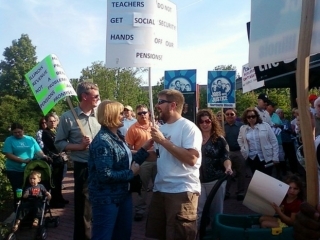 While many are following the manufactured cliff debate in Washington, in Illinois, a Democratic House, Senate and Governor are attempting to wash their hands of their financial mismanagement of teachers’ pensions once again. Illinois’ veto session is our “lame duck” session and, hard to move legislation like public employee pension rip-offs is back on the table. In Springfield there is no progressive voice in the room proposing that the general assembly rescind the $85 million/per year tax break to the Chicago Mercantile Exchange (CME). There have been no proposals to implement a tax on contracts at the CME (our Wall Street) and, there have been no proposals to modernize Illinois’ tax code with a graduated income tax. The money thrown at corporations by states to invite investment is a boondoggle that should be ended by federal law. Gerald Epstein is the Co-Director of the Political Economy Research Institute and professor of economics at the University of Massachusetts-Amherst. Most major issues remain unresolved at the U.N. climate summit in Doha as negotiators enter the final stretch of the two-week summit. While the Doha talks involve nations working toward a pact to limit greenhouse gases starting in 2020, many say the world cannot wait that long. The United States has come under intense criticism at the summit from environmentalists and smaller nations who say President Obama has failed to meet his stated commitments to tackle global warming. We’re joined by Kumi Naidoo, executive director of Greenpeace International; and Samantha Smith, head of the World Wildlife Fund’s Global Climate and Energy Initiative. “We should not have called it Hurricane Sandy. We should have called it Hurricane Exxon,” says climate activist Bill McKibben. In the aftermath of a superstorm, Americans are finally making the connection between the changing weather and our fossil fuel addiction. McKibben took a break from his “Do the Math” tour, which calls on universities and other organizations to divest from the fossil fuel industry, to discuss the pressing structural changes we need to slow our warming planet.